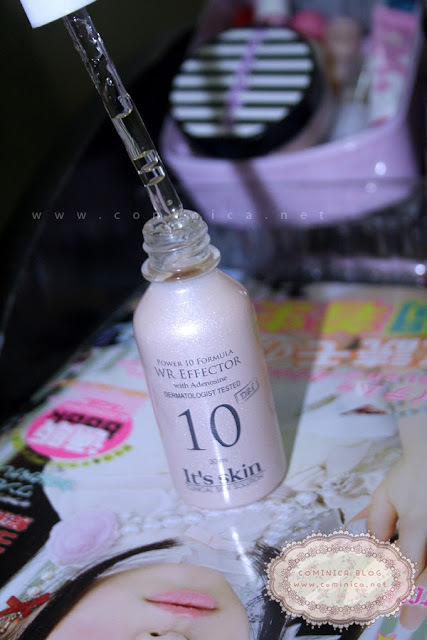 I heard many good things about this Serum from my friends in Taiwan. 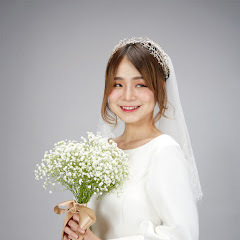 She said this Power 10 line once appeared and recommended in TV shows. It's skin is a dermatological brand prescribed by Dermatologist with various clinical experiment. ( *___*) sounds promising? 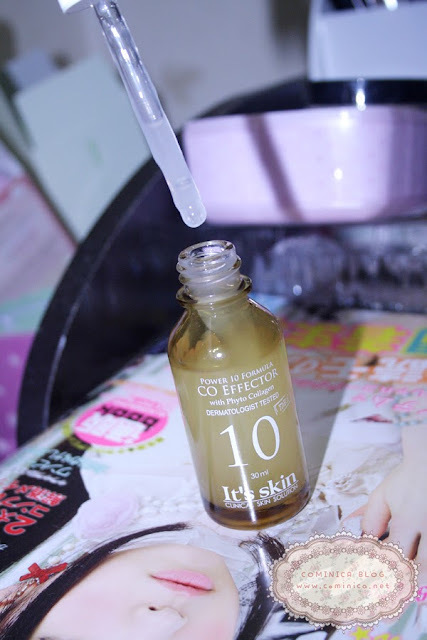 I finally managed to try this popular serum from It's skin, I chose 3 different serum to try. 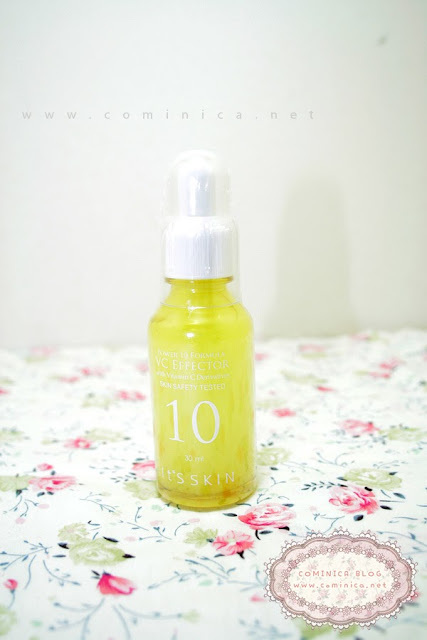 The Power 10 line has many types of serum with their own different benefit. 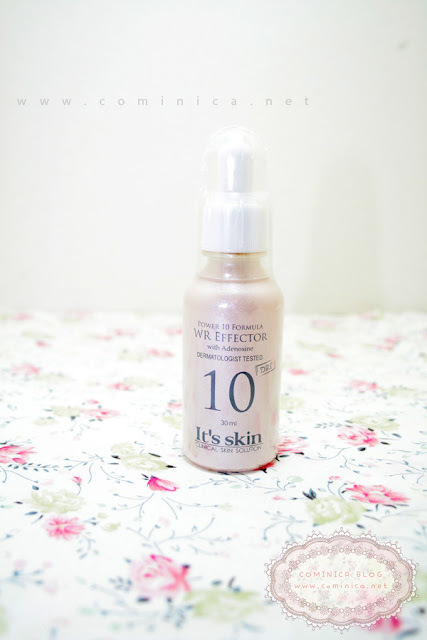 Power 10 Formula VC Effector, Power 10 Formula WR Effector and Power 10 Formula CO Effector. Cute and small little bottle, reminds me to baby milk bottle. Each bottle contain 30ml and wrapped in clear plastic to guarantee it's authenticity. Brightening serum contain Vitamin C and green tea components, can help brighten freckles and makes skin look brighter and not dull. It can help tightens pores, leaves skin fair and luminous. As everybody know, Vitamin C is an anti-oxidant that slows skin dryness, wrinkles and fine lines. Vitamin C can also reduce sunburn and help skin look brighter and clearer. The color of the serum is look a bit yellow, with transparent and light texture liquid. Easy to absorb to skin and leaves skin smooth, not oily! I started to use vit C serum because I have many scars on my skin, like acne scars, skin discoloration and freckles that makes my skin look dull and not clear. About the scars, it brighten new acnes scars but the old one can't. I'm happy enough because this serum doesn't has any bad effect to my skin. If you feel your skin look dull and not even, you can try this serum. I think the price isn't expensive since you can use this for 1-2 months. This collagen serum concentrated with vegetable collagen extracts hydrates the skin from the inside, giving it a look of effervescence and resilience after applying. Collagen gives your skin its strength and assists with wound healing. As you get older, the network of collagen in your skin begins to degrade, leading to eventual wrinkles and sagging. My skin can feel a little bit dry sometimes, well I only sleep about 2-4 hours in weekdays because of insomnia. Lack of sleep can cause skin loss water and dry. Dryness can cause wrinkle appear faster on skin. That's why I added collagen to my skin remedies. The texture is not different from the VC effector, the color is more opaque. The formula is hydrating our skin, leaves skin bouncy and moist. 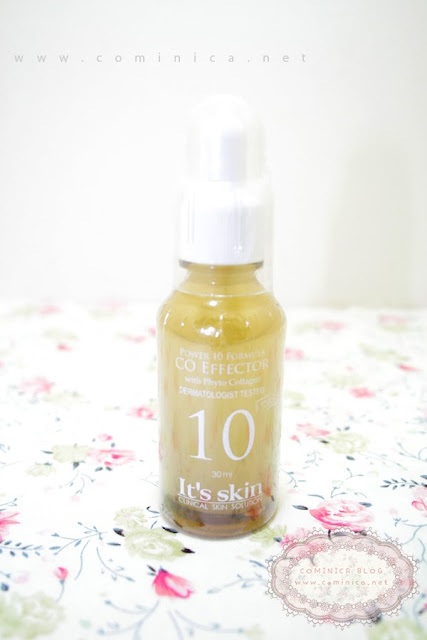 This serum isn't works too good on me because I have combination-sensitive skin. 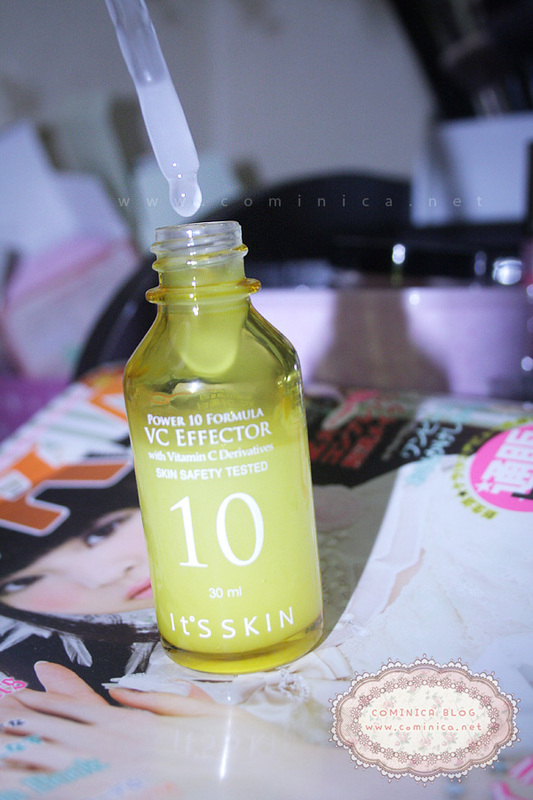 My T-zone usually oily and this serum can feel too much on the area. So, I just use this serum on my Cheek and Neck. I don't recommend this serum if you have oily face and troubled skin. Essence containing Caviar and Mistletoe extract; can reap the synergy effects of wrinkle care and resilience functions of adenosine, which visibly diminishes creates and recovers the lost resilience of skin to give a youthful look. Adenosine is a chemical that is present in all human cells. Caviar is well known as ingredients for anti wrinkle skin care. Caviar extract is very rich in vitamins A, D, B1, B2, B6 and can slow down the aging process by moisturizing the skin. Caviar extract firms your skin and provides the highest possible level of hydration, and said it can well absorbed without any allergic reactions. Mistletoe extract can halt skin cancer and usually use to treat for medical conditions. It can protect our DNA and perhaps can help slow down skin aging. Honestly this serum texture is the most dense of them all. 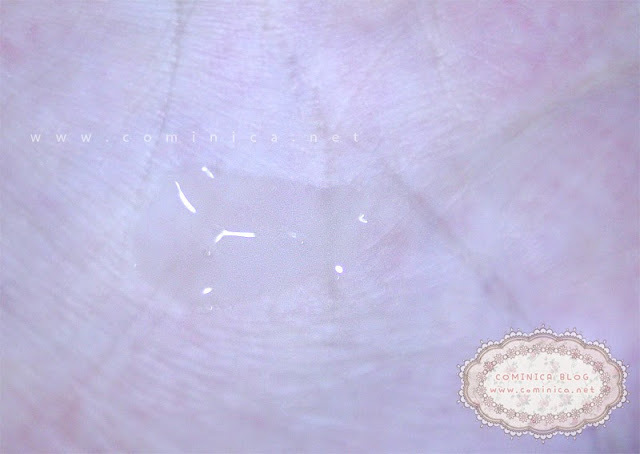 The color is transparent and a little bit like watery light honey testure. Well, you probably are wondering why I chose this anti-wrinkle serum. Hahahaha. In my age, some articles said I don't really need anti wrinkle skin care since I don't need them yet. Usually people in their 30 can use anti wrinkle skin care. But I want to protect my skin first before it is late. I only use this serum three times a week at night and feel my skin is super hydrated after applying the serum. In the morning, my skin look a bit oily and when touched it feels elastic. lol. After wash my face it feels so smooth too! BUT, please don't use this serum if your skin is troubled because I don't think it'll work on you. It is really hydrating and probably can make your acne worse. Btw, I now want to buy the vitamin C serum.. but It's Skin is sort of hard for me to get in Sydney. Hi! I'm just wondering, do you use these serums all at once before you sleep? *A* Thanks for sharing this info! Shopping mall for Korean cosmetics. 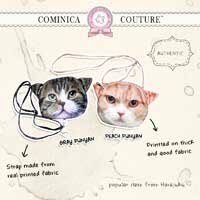 30% Sale in March!!! gave escalation to the newest devices of advanced humanity. i - Pad, what software should you use for your writing.